From February 23 through April 8, immerse yourself in the U.S. Botanic Garden's annual orchid show, presented in collaboration with Smithsonian Gardens. Found on every continent except Antarctica, orchids showcase a wide spectrum of diversity in color, shape, size, habitat, scent, and many other aspects. 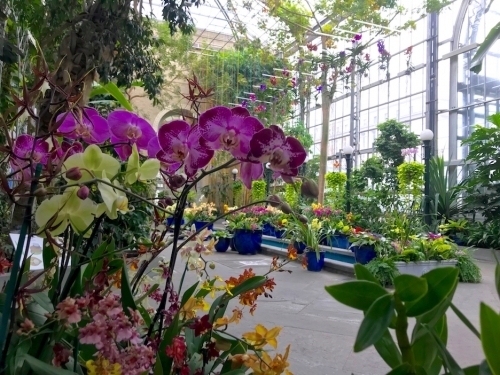 Explore thousands of amazing orchid blooms arranged in captivating displays, and appreciate many unique, rarely seen orchids from the USBG's and Smithsonian Gardens' extensive plant collections. There are approximately 30,000 orchid species, making the orchid family (Orchidaceae), one of the two largest families of plants in the world (the other is the daisy family, Asteraceae.) Orchids are prized for their gorgeous flowers and highly specialized pollination methods, but their diversity contributes far greater rewards to the habitats in which they grow. Many orchids provide food for insects and birds and even more have symbiotic relationships with micro-organisms that assist with nutrient cycling in the ecosystem. Many orchids are rare or endangered due to excessive collecting of wild plants and habitat destruction. As a result, all orchids are protected by the Convention on International Trade in Endangered Species of Wild Fauna and Flora (CITES). Despite this protection, illegal collecting and trade persist. When someone tries to smuggle a wild orchid into the U.S., the orchid is seized by the U.S. Fish & Wildlife Service and sent to rescue centers like the U.S. Botanic Garden and Smithsonian Gardens. North America is home to over 200 orchid species, and more than half are endangered or threatened somewhere in their native range. The United States Botanic Garden (USBG), the Smithsonian Institution, and several other public gardens are working together to conserve orchids native to North America. Explore a few examples celebrating the diversity of orchids, then visit the USBG during the Orchid Spectrum exhibit to learn more. This Cymbidium tracyanum is a fragrant orchid native to Indochina and southern China. Fragrance can be an important part of attracting pollinators and ranges from very sweet to strongly unpleasant (to the human nose). Gongora, and Vanilla are alluring to male euglossine bees who collect fragrances to attract their own mates. Other orchids have an unpleasant or fetid odor, mimicking carrion, dead fish, or other fermenting matter in order to attract insect pollinators such as flies and beetles. In some cases, the flower's odor mimics the pheromones (airborne chemical signals, usually imperceptible to humans) of the pollinator, thus fooling the insect into thinking the flower is a potential mate. Other orchids emit rich fragrances reminiscent of honey, mint, lemon, musk, chocolate, coconut, cinnamon, or even freshly mown grass. Many have become important components of commercial perfumes. Some cultivars, such as Oncidium 'Sharry Baby' and Oncidium 'Twinkle' have been bred to have particularly sweet scents. Orchid morphology (the external plant features) is a reflection of the plants' evolution across a spectrum of habitats and in concert with a diversity of pollinators. The water-spider orchid (Habenaria repens) is North America's only aquatic orchid. Sometimes it forms floating mats in ponds, where its green flowers reflect moonlight and emit fragrance at night. This attracts moths, who brush past the stigma and pick up pollen on their way to get to the flowers' nectar. Some orchids rely on foolery for pollination. The bright pink color and sweet scent of the moccasin flower (Cypripedium acaule) lure hungry young bees into a deep pouch. Once ins ide, there is no reward and the bees must escape by climbing up and squeezing past the reproductive column, picking up or depositing pollen along the way. The rosebud orchid (Cleistes divaricata) also tricks pollinators into visiting its flowers--a yellow crest on its lip resembles pollen. Through adaptation over time, orchids have evolved to appeal to a wide variety of pollinators. Some orchids mimic the appearance and scent of bees or wasps, attracting would-be mates or attackers to pollinate their flowers. Butterflies and moths are enticed to pollinate orchids that resemble flowers they normally feed on or orchids that provide a landing area and sufficient nectar rewards. Moth-pollinated orchids tend to have strong nighttime fragrances to attract their pollinators from great distances. In higher-elevation cloud forests where there are fewer pollinators, some orchids have evolved to have brightly colored tubular flowers with large nectar rewards to entice hummingbirds. Humans have also played a huge role as pollinators for many orchids, as our desire for larger and more brightly colored flowers drives us to cross-pollinate and breed new types of orchids. Terrestrial orchids (orchids that grow in the ground) are found in a diversity of climates and habitats such as forest floors, bogs, semi-arid deserts, savannahs, and sandy dunes. Most terrestrial orchids grow with the aid of fungi that provide additional nutrition and expand the reach of their root systems through a symbiotic relationship called mycorrhiza. Plants that grow attached to other plants without parasitizing them are called epiphytes (epi=upon, phyto=plants). Epiphytic orchids are primarily found on tree trunks and branches, mostly in moist habitats such as tropical and temperate rainforests. Their placement on host trees can vary widely--some epiphytic orchids grow in dappled light or deep shade lower on trees, while other species grow in the brighter light of the canopy.